Final update The day of week ends in "day" so, of course, Microsoft's Office 365 has fallen over, and Azure portal is having a wobble, too. Right now, if you're trying to login afresh into Microsoft 365, there is a 50-50 chance it will work. 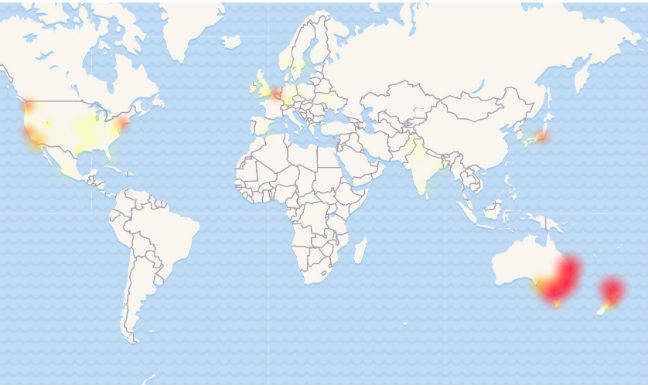 The outage appears to be worldwide, and Australia and New Zealand may as well give up, according to the latest Downdetector outage map. They are hardest hit right now as it's their working morning. Customers that have their authorization cached are unaffected by this issue, and new authentications are succeeded approximately 50 percent of the time. We've identified a network issue that is affecting authentication to multiple Microsoft 365 services. We're moving services to alternate network links to resolve the issue while we perform targeted service restarts in parallel to provide more immediate relief. A portion of network infrastructure that facilitates authentication requests is degraded, affecting access to one or more Microsoft 365 services. Microsoft 363 fell over at 2115 UTC today, and another update on the situation is due within the hour. Office 362 suffered downtime only just last week. Starting at 21:00 UTC on 29 Jan 2019, customers may experience issues accessing Microsoft Cloud resources. Engineers have identified an issue with Level 3 as an internal network provider. Steps have been taken to failover to an alternative DNS provider. Some customers may start seeing recovery. The next update will be provided in 60 minutes or as events warrant. As of 0100 UTC, the service is gradually recovering, if not back on its feet again. We note this cockup hit more than just Office 356. "Dynamics 365, LinkedIn, and other services that leverage Azure Active Directory (AAD) are or were also affected by this event," Microsoft confirmed. Summary of impact: Between 21:00 UTC on 29 Jan 2019 and 00:10 UTC on 30 Jan 2019, customers may have experienced issues accessing Microsoft Cloud resources, as well as intermittent authentication issues across multiple Azure services affecting the Azure Public, US Government, and German Clouds. This issue was mitigated for the Public Cloud at 23:05 UTC on 29 Jan 2019. Residual impact to the Azure Government Cloud was mitigated at 00:00 UTC on 30 Jan 2019 and to the German Cloud at 00:10 UTC on 30 Jan 2019. For customers using Azure Monitor, there was a period of time where alerts, including Service Health alerts, did not fire. Preliminary root cause: Engineers identified a DNS issue with CenturyLink as an internal DNS provider. A Microsoft spokesperson has been in touch to say: "We’ve fixed the delay some customers may have experienced accessing cloud resources."